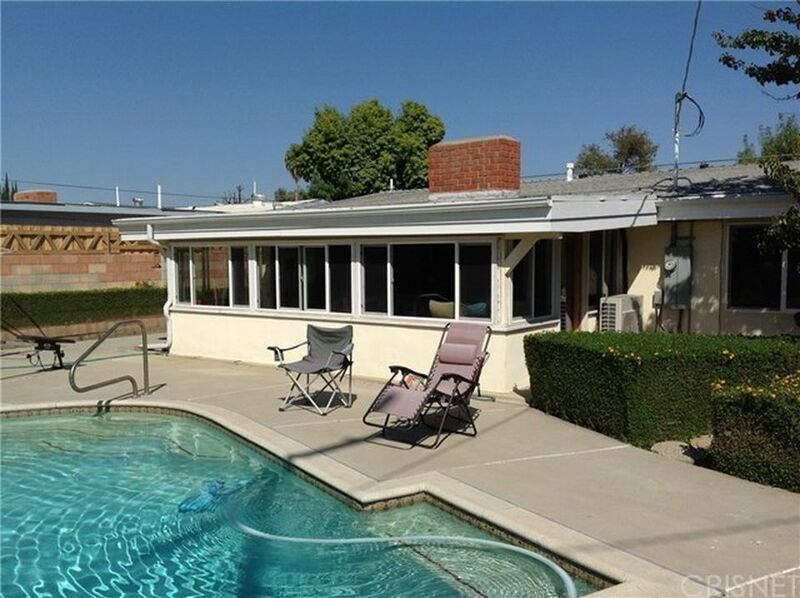 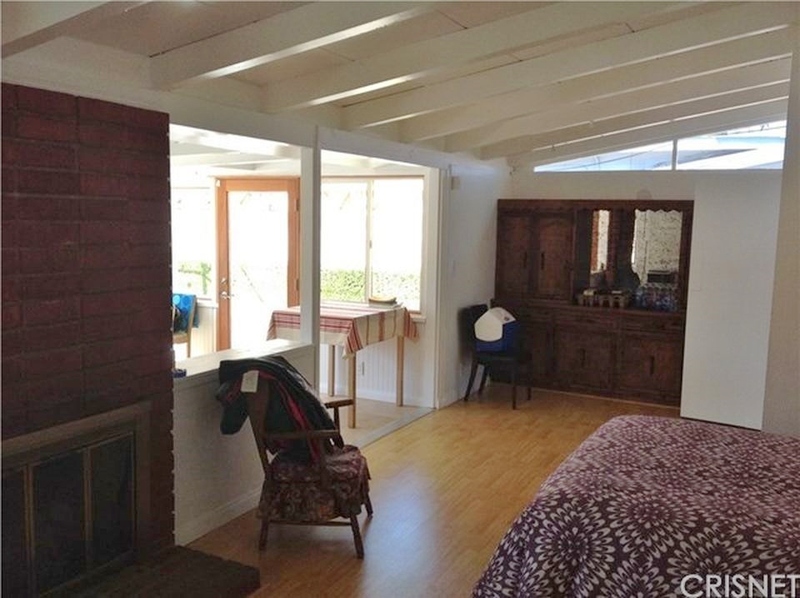 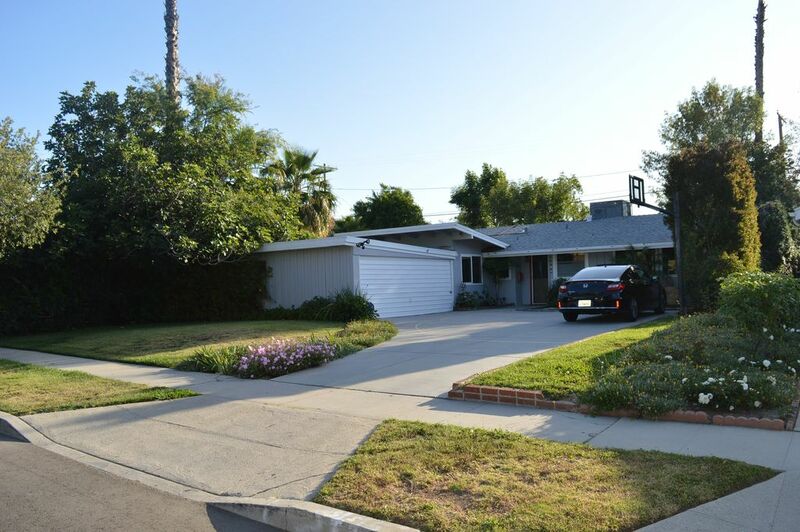 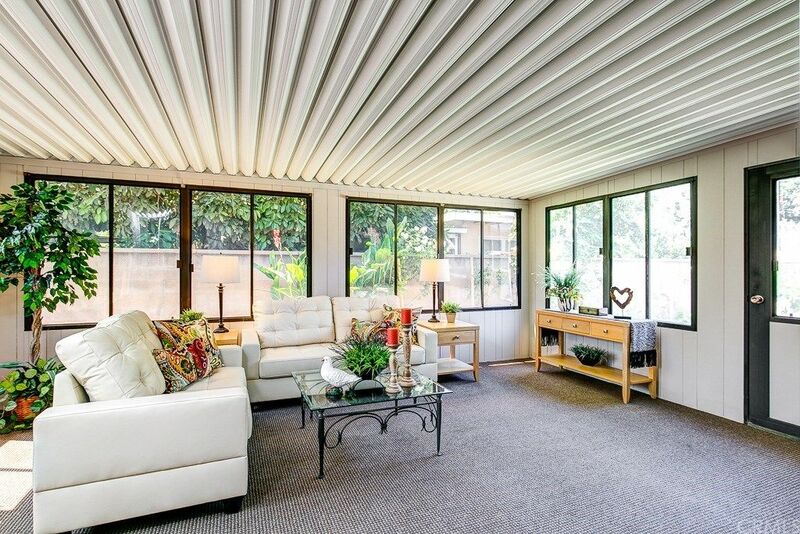 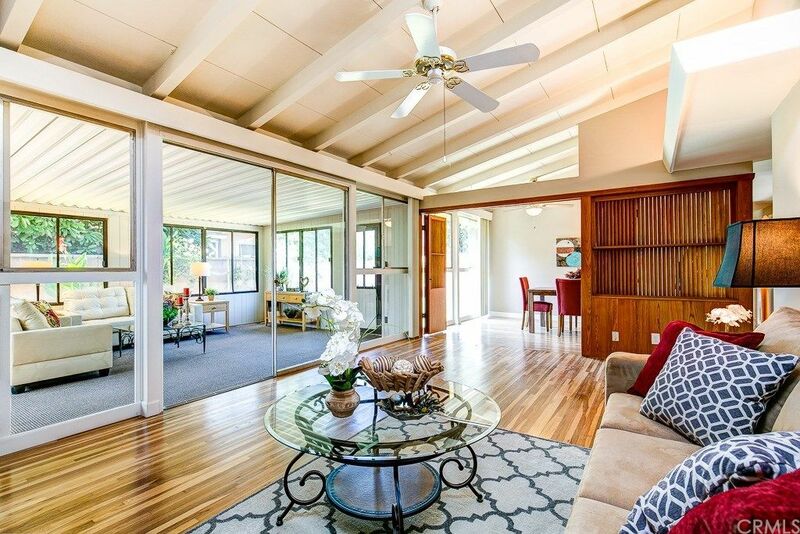 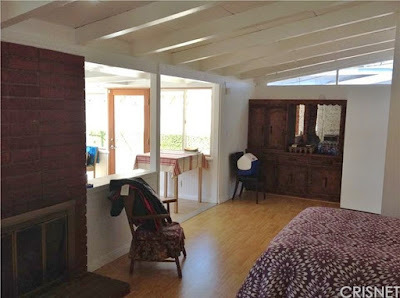 Built in 1954 is this Palmer & Krisel designed short-sale home in iconic Corbin Palms in Woodland Hills, CA in the San Fernando Valley. 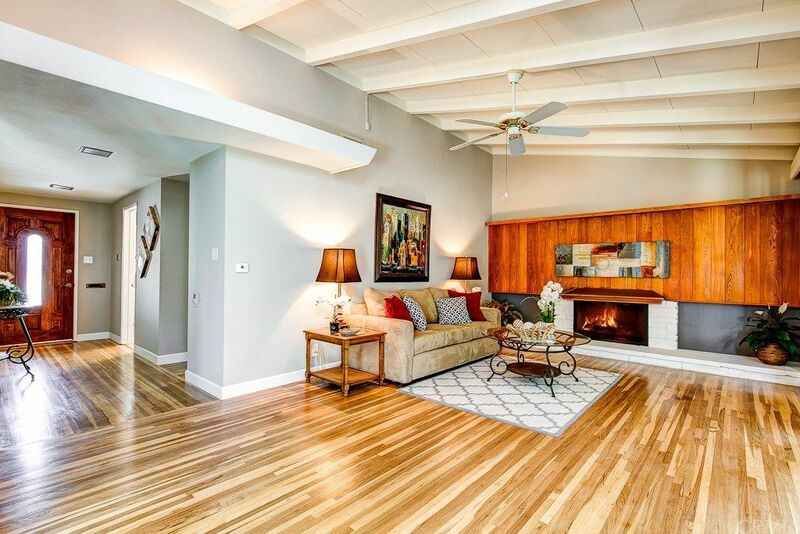 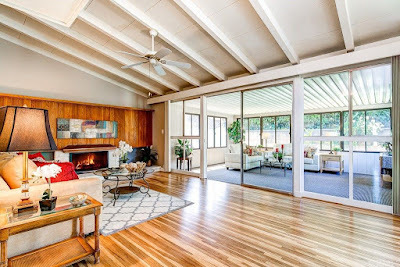 Built by the Alexander Construction Company, this midcentury home features three bedrooms and two bathrooms in 1,532 expanded square feet, sits on a 7,500 square-foot lot and carries an asking price of $550,000. With a few exterior modifications, the home features a couple of altered rooflines and elongated front replacement windows, which chops up and changes the proportions of the home from what was originally offered. 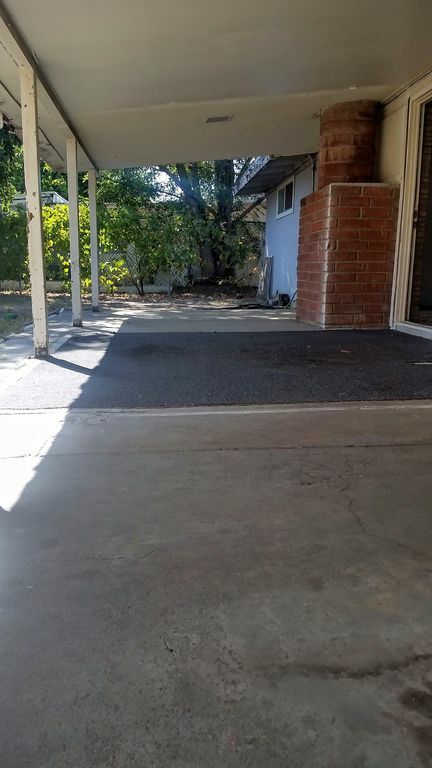 The breezeway between the two-car garage and carport has been enclosed, and a reverse-angle roofline has been placed over the addition, while the garage contains a roofline bringing a third roof pitch on to the front of the home. Most of the original board-and-batten finish is still on the exterior on the home along with original stucco, and a green lawn with mature landscape welcomes visitors to the home. 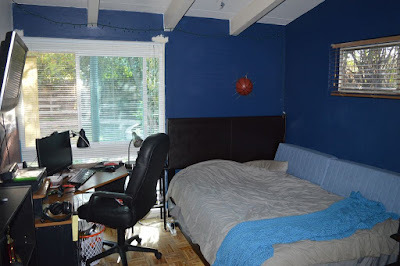 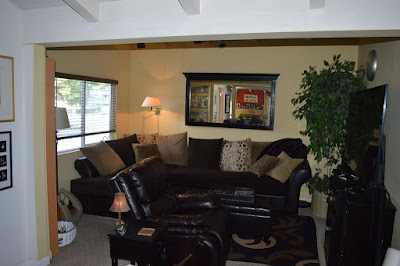 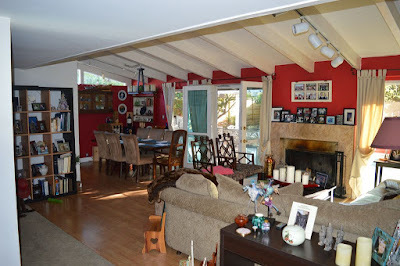 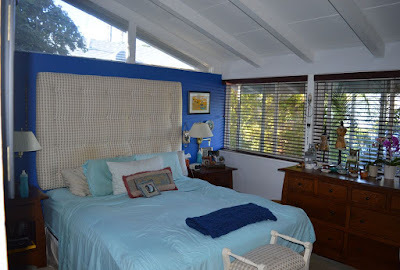 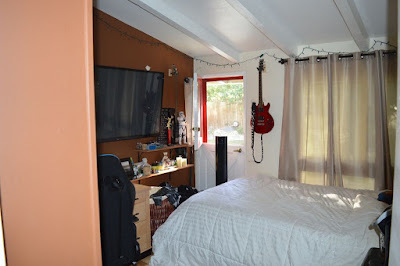 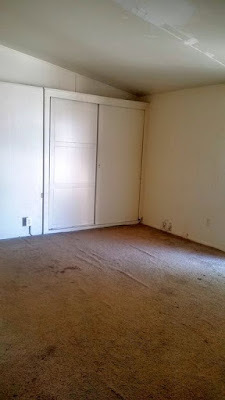 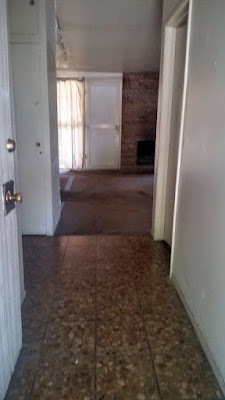 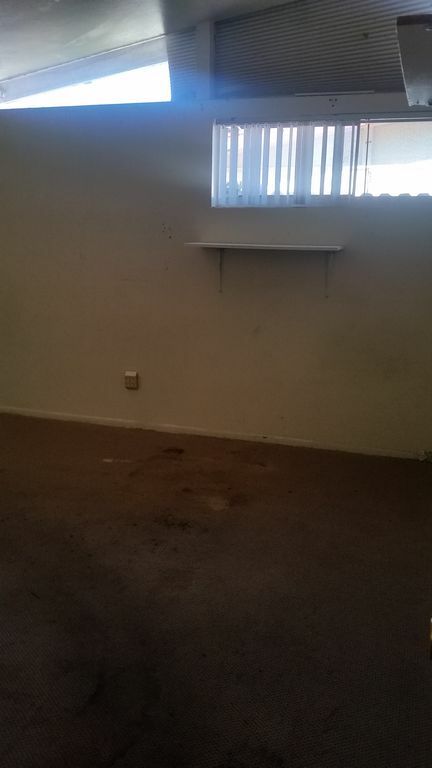 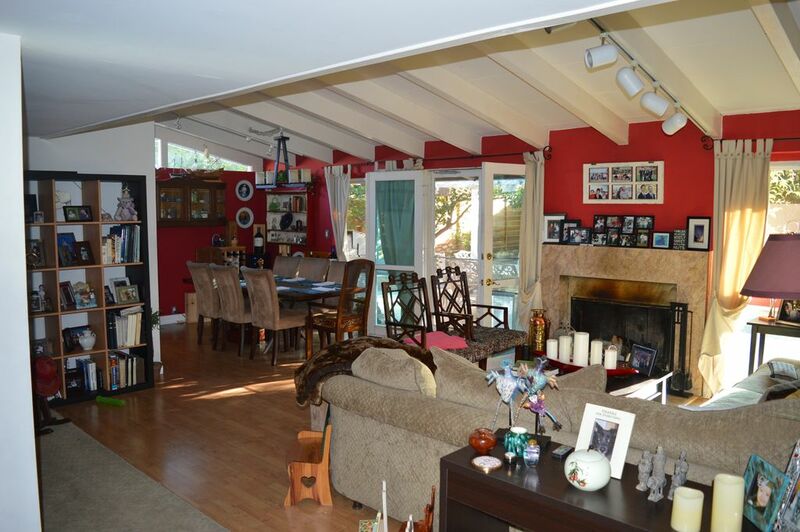 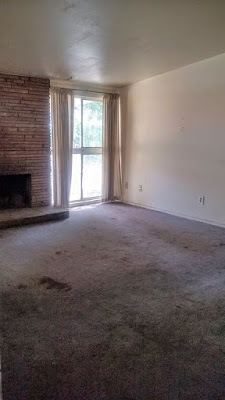 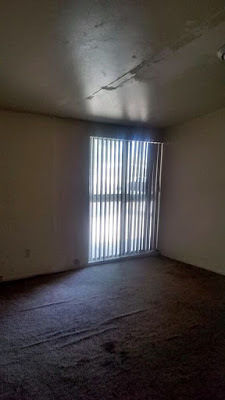 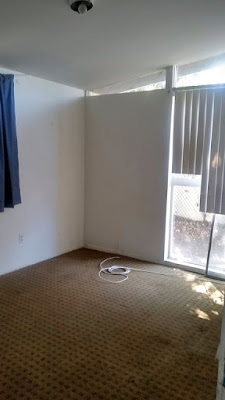 Inside, the home shows fairly cluttered, as the current homeowners furniture is fairly large scaled. 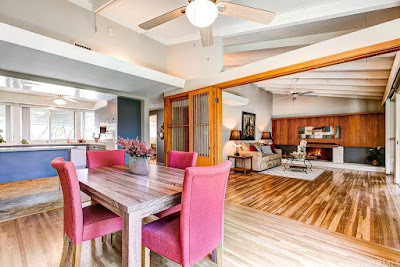 The living and dining rooms sit towards the rear of the home, while the kitchen sits adjacent to the south side of the home. 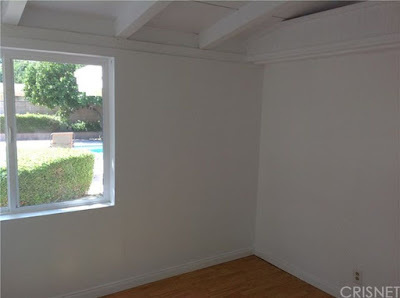 A fourth bedroom once sat between the entry and kitchen, but it has now been converted to an open pass through area, that leads towards the family room addition that sits at the front of the home between the kitchen and garage. 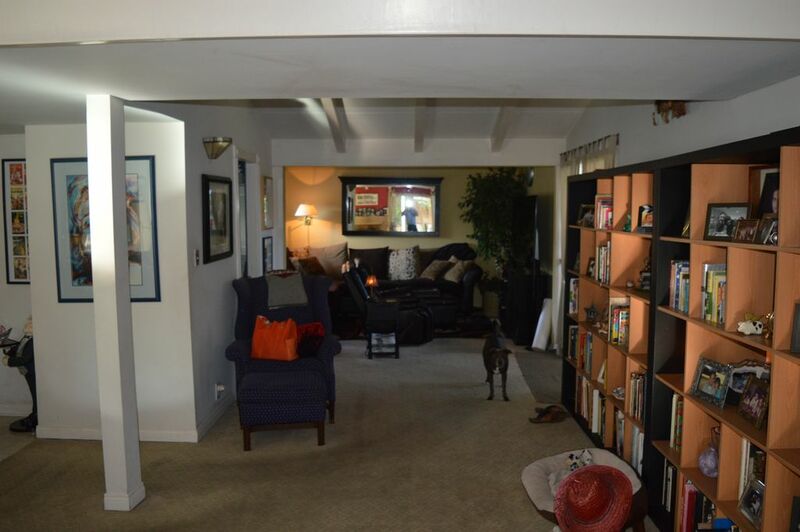 All three bedrooms lie along the north side of the home. 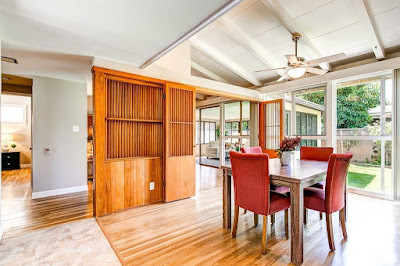 The living and dining rooms overlook the backyard through original floor-to-ceiling windows and two-pane French doors. 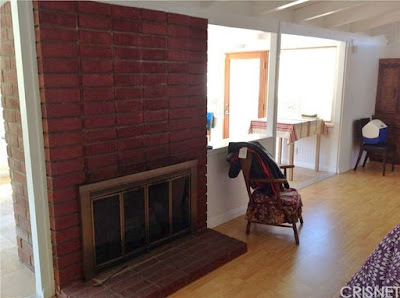 The original fireplace location is intact, however the hearth and surround has been traditionalized, with tile surrounded and a flattened overmantle. 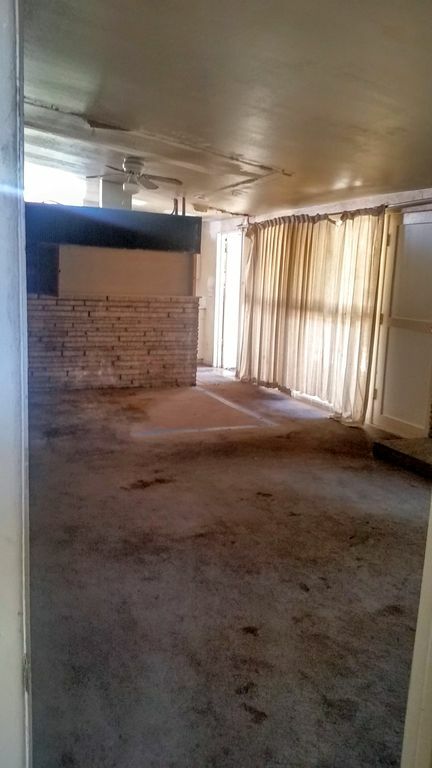 Hopefully the original stacked brick is under all that drywall and intact. The kitchen has been seen newer raised panel cabinetry added to it, some with glass fronts, granite counters and black appliances. 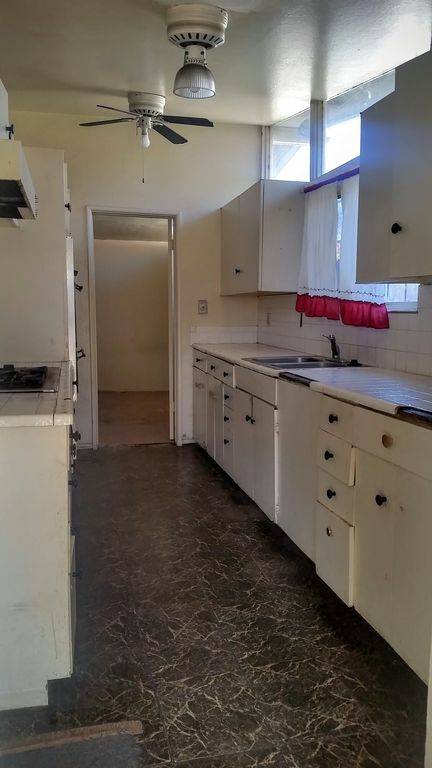 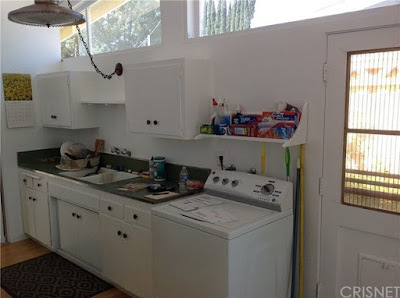 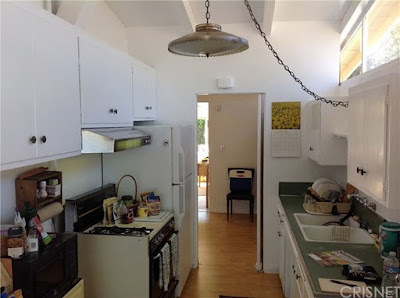 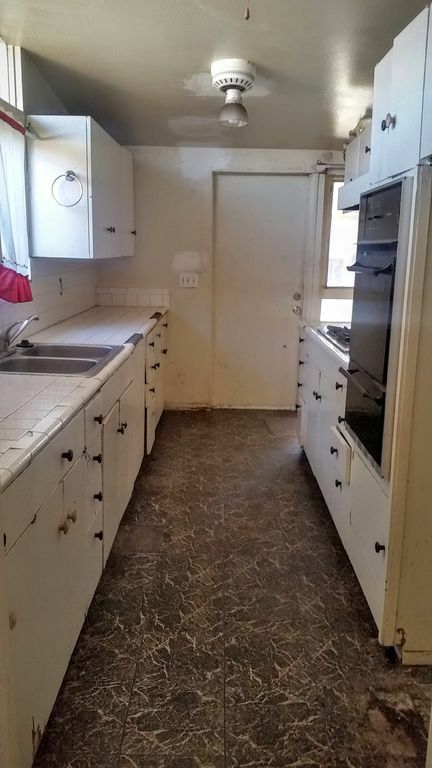 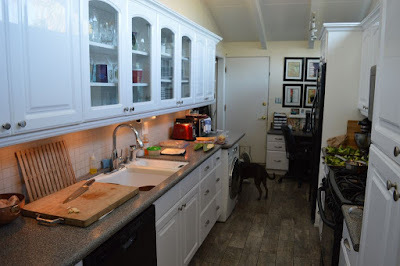 While not modernist or complimentary of the architecture of the home, the kitchen is functional and still has a few more years of life left in it. 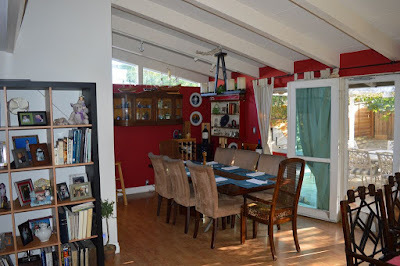 The original south-facing clerestory windows above the cabinetry are still in place, as are the open beamed celotex paneled ceilings, allowing for the home to be filled with natural light. 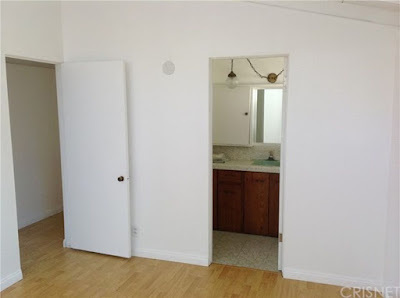 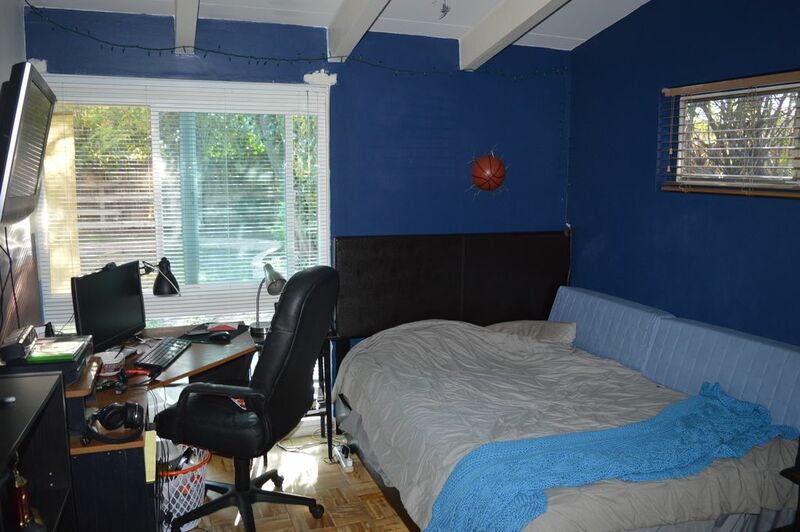 All three bedrooms lie along the north side of the home, and due to the bath layout there is no true master. Both bathrooms have been updated over time, both with heavy traditional undertones and ornate detailing. 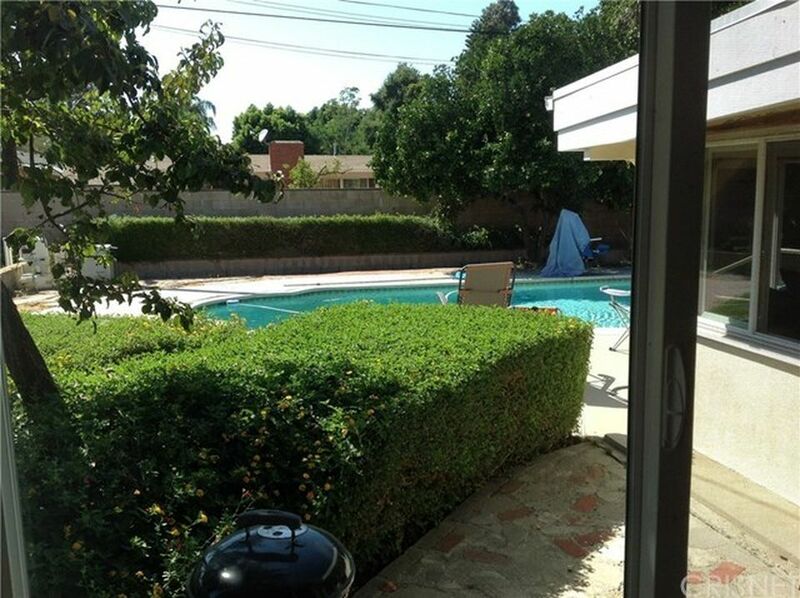 The west-facing backyard features a modest-sized trellised patio adjacent to the living and dining rooms, and is lined with lots of mature trees and shrubs around the perimeter. 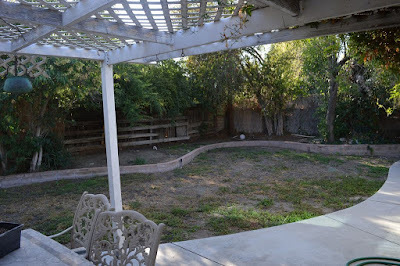 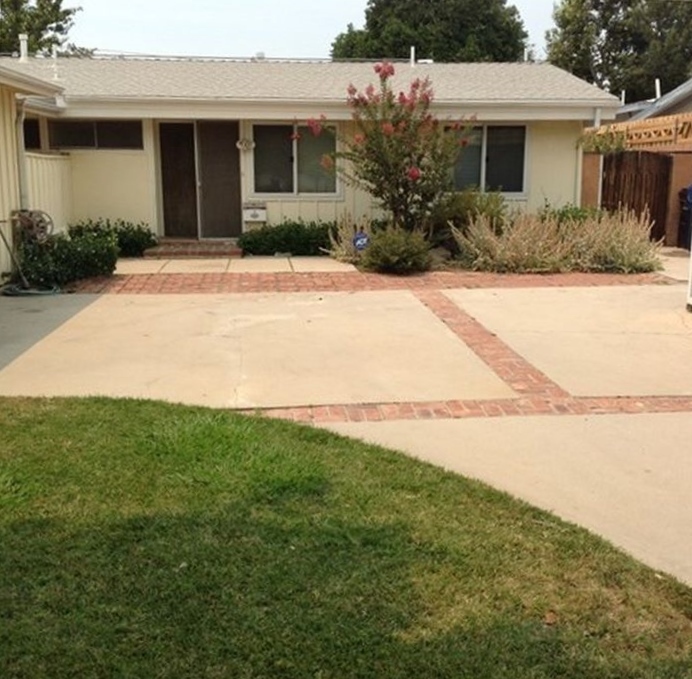 A small patch of curvilinear turf sits adjacent to the patio and walkways, and a variety of fences surround the yard. 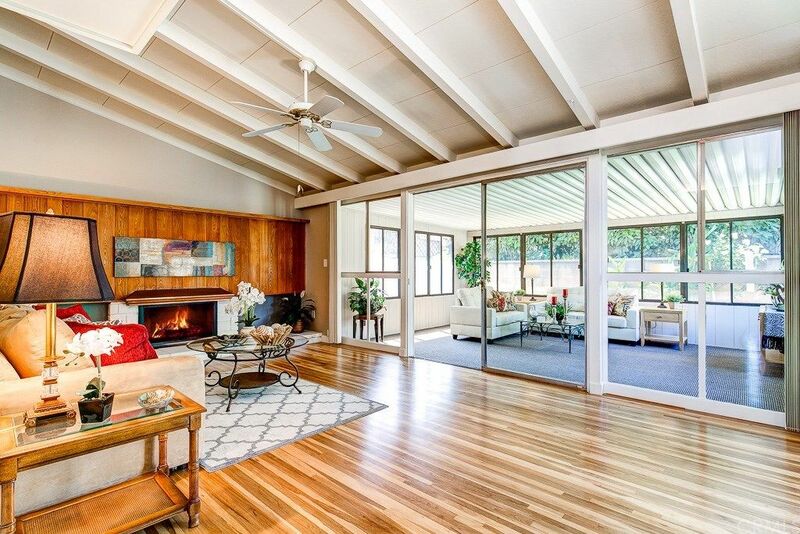 There’s quite a bit of opportunity with this midcentury home to take it back to its modernist roots. 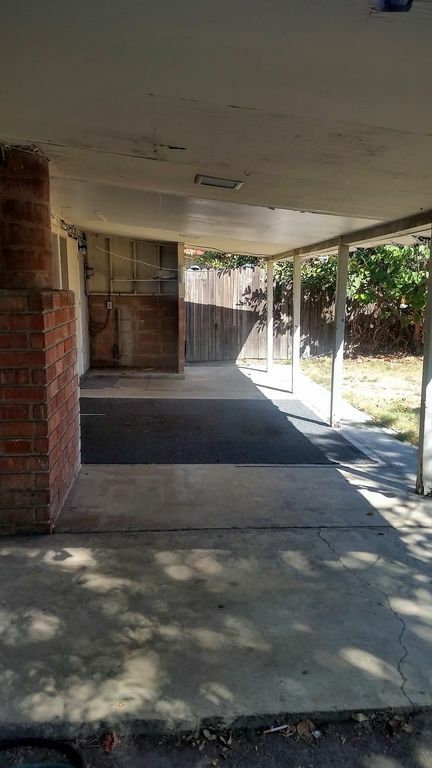 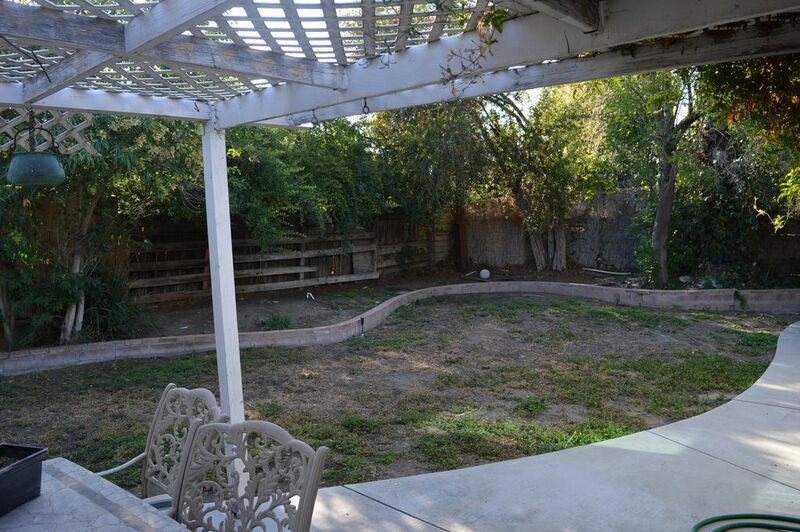 If you’re willing to endure a short sale and have a bit of vision, this could be a great opportunity. 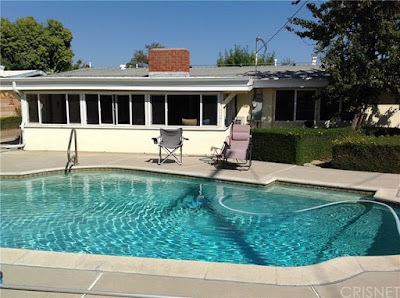 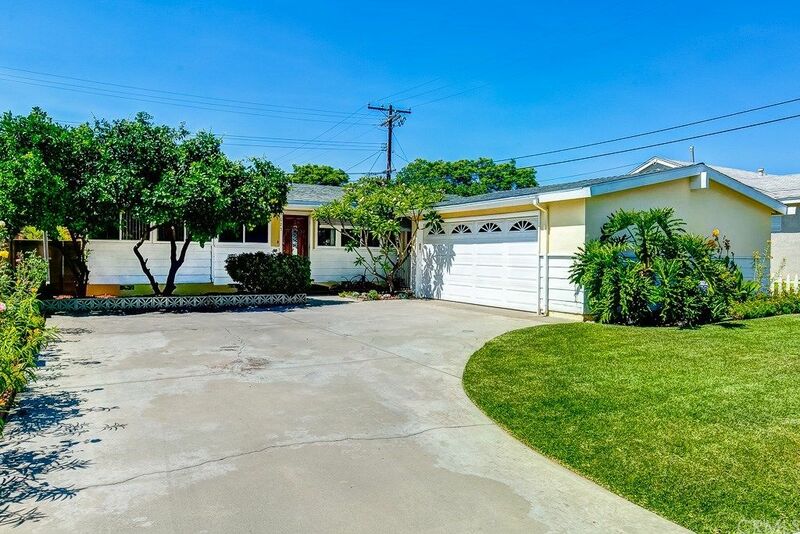 Built in 1956 in central Anaheim, CA is this pristine and vintage Palmer & Krisel-designed home relatively new to the market. 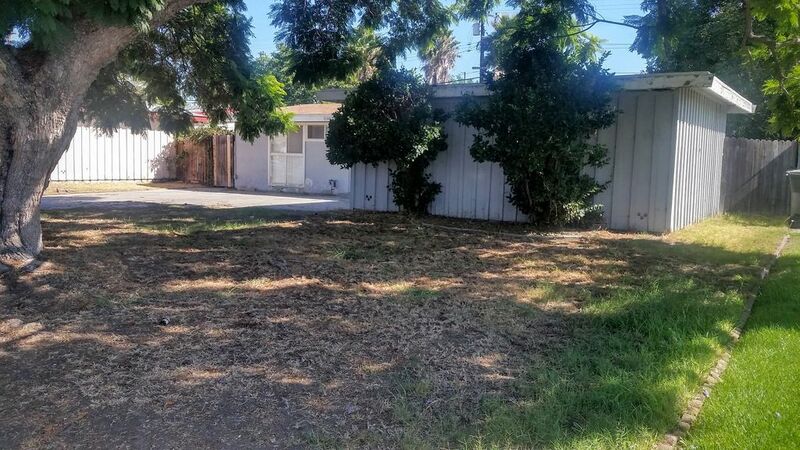 With three bedrooms and two bathrooms in 1,415 square feet sited on a 6,000 square-foot lot, the asking price of this home is $539,900. The exterior of the home shows as classic midcentury, with a combination clapboard and stucco finish on the exterior of the home painted in soft yellow and white. 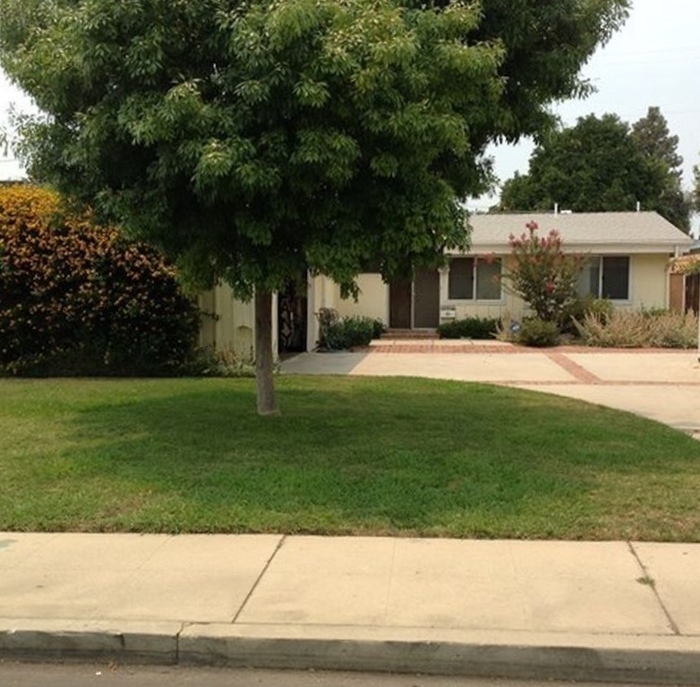 A lush green lawn sits between the home and the street, and mature shrubs line the front of the home. 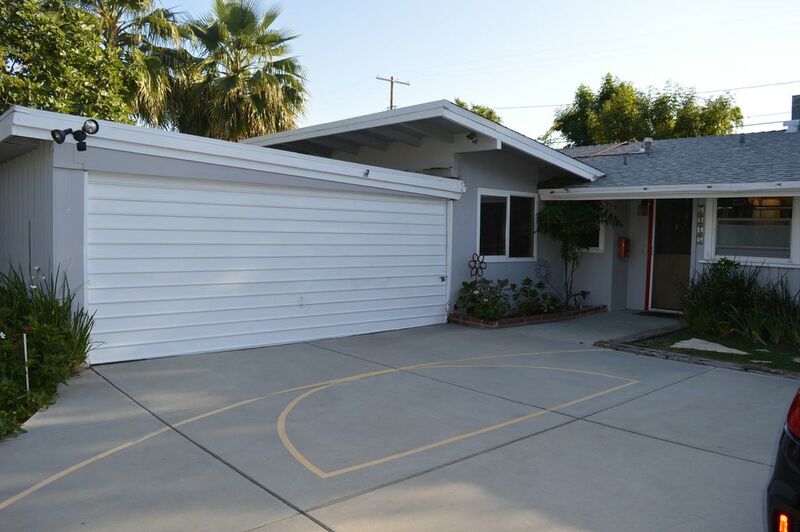 The sunburst garage door and traditional cottage front door are the only two later additions which don’t quite fit the style of the home, but both are easily replaceable. Inside, the living and dining rooms lie along the back of the home, while the kitchen sits at the front and all three bedrooms are located along the south half of the home. 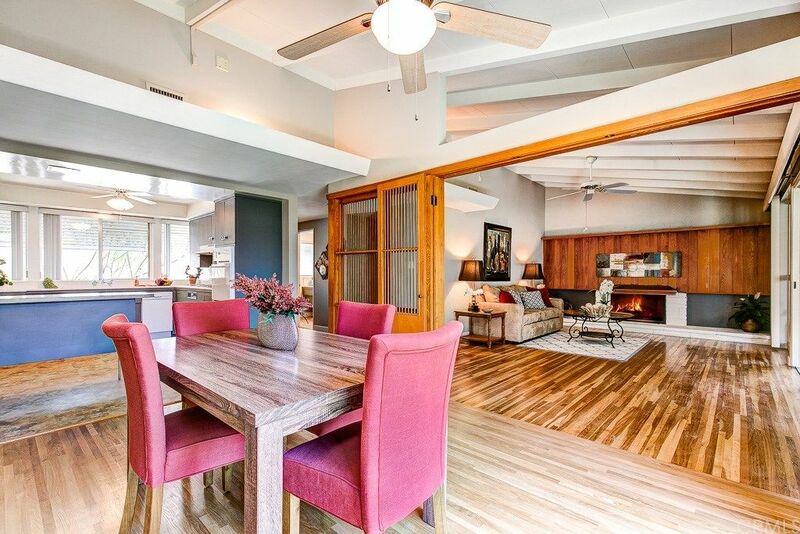 The living room features a wall full of floor-to-ceiling windows, which originally would have overlooked the backyard, but now overlook an adjacent sun porch. 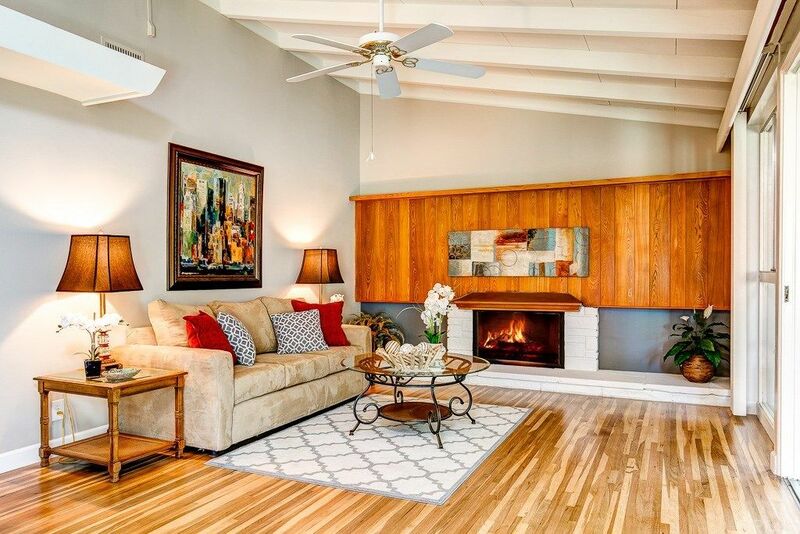 The south wall of the living room is anchored by Krisel’s signature modernist fireplace, topped with original wood paneling. 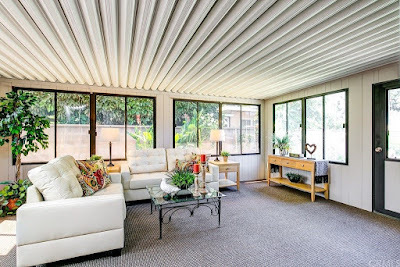 The open beamed celotex ceilings are still in place, adding height and volume to the living room and adjacent dining room. 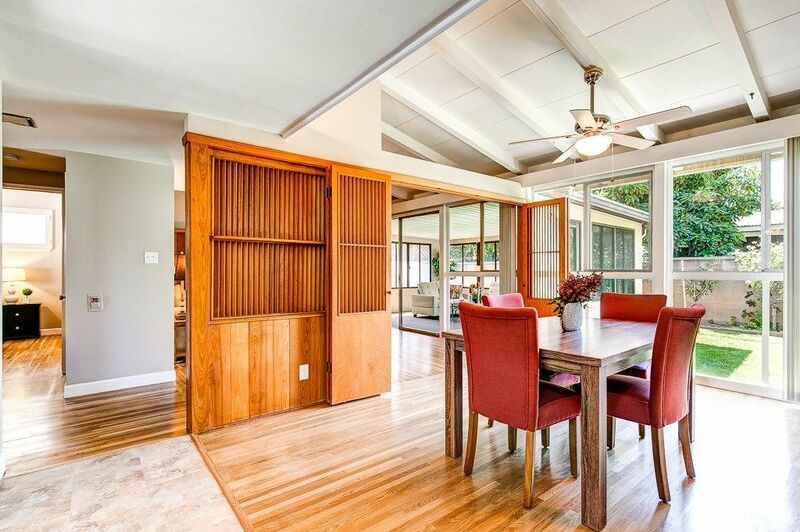 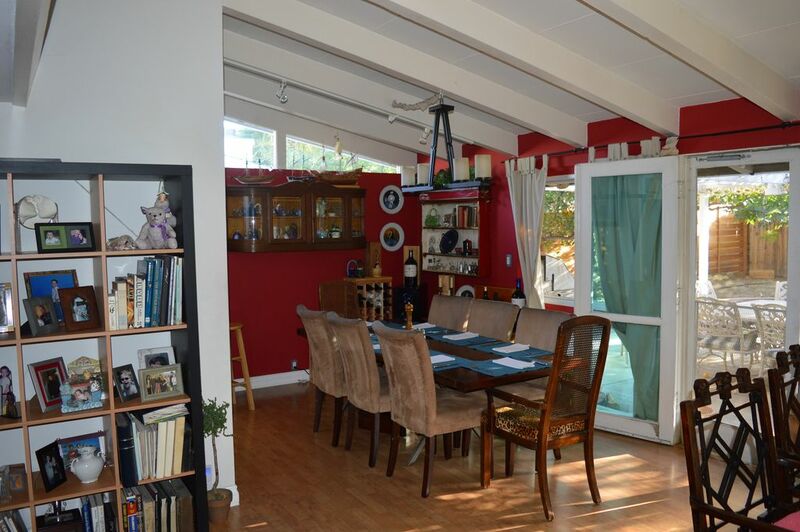 The dining room features a pretty great vintage dividing screen that we’ve only seen on a handful of other Krisel subdivisions, and is fully open to the adjacent kitchen. 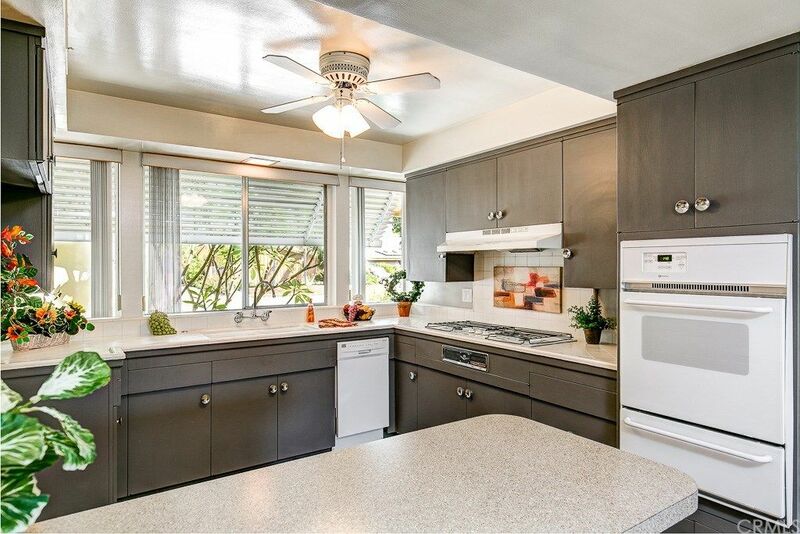 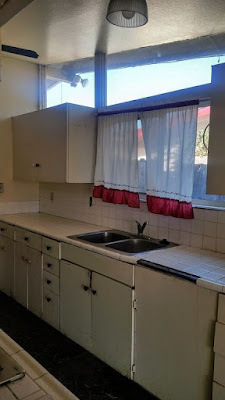 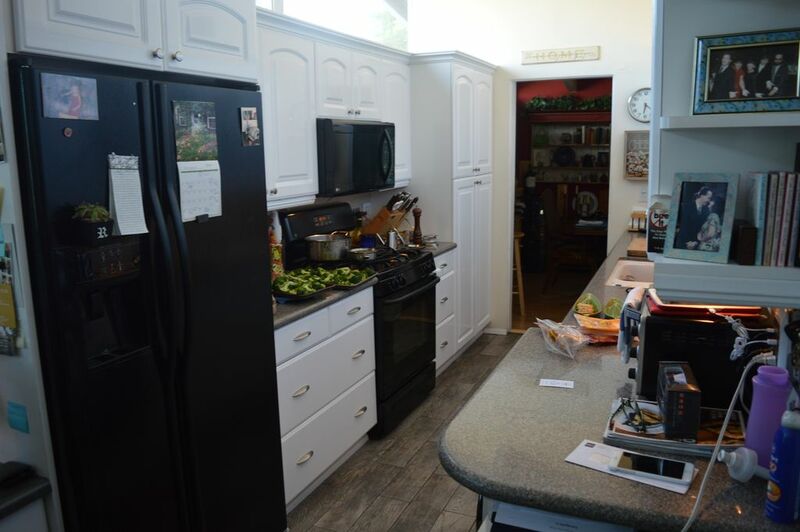 The kitchen features exceptionally well-cared for original cabinets with shiny chrome saucer pulls and laminate counters. The original push-button range is still in place, along with the floating island with nifty sliding door fronts. 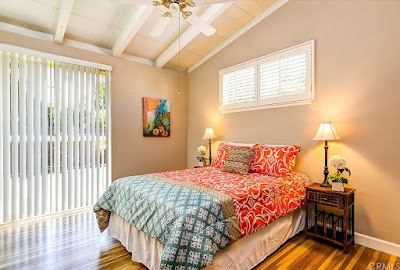 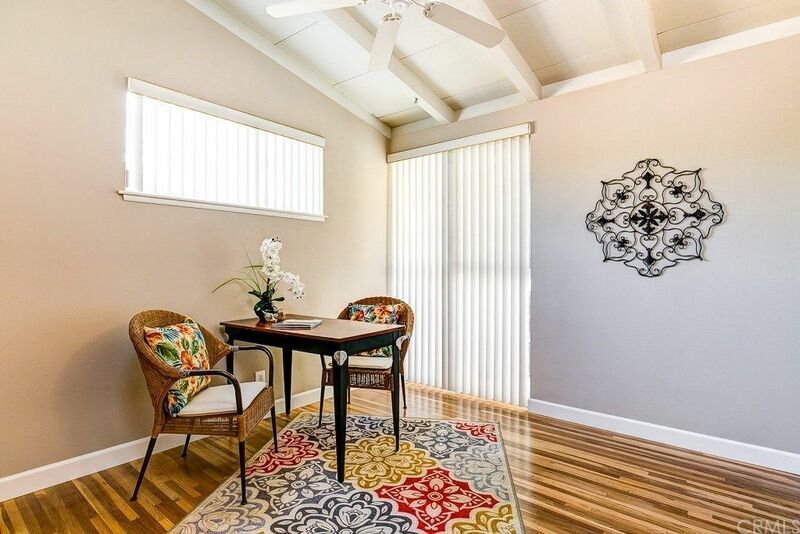 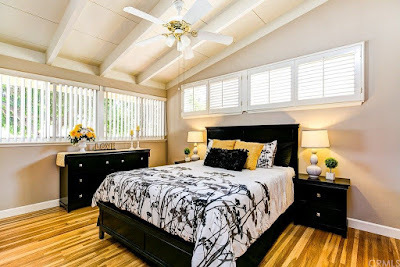 All three bedrooms feature vaulted ceilings, hardwood floors, and both end bedrooms feature windows on two walls allowing for lots of natural light to enter the rooms. 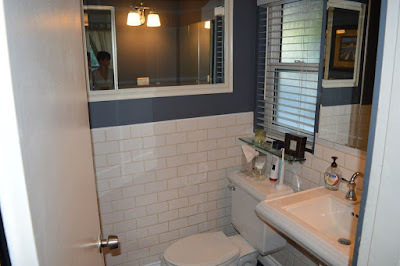 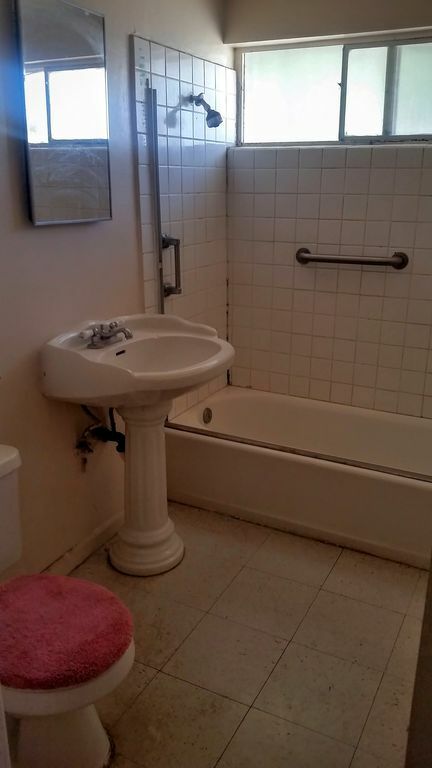 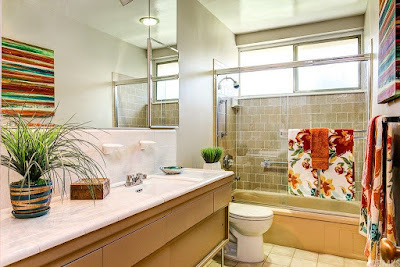 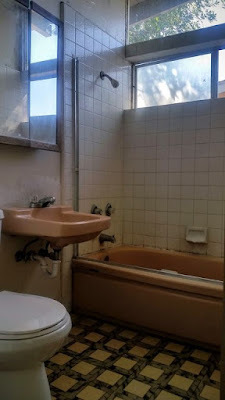 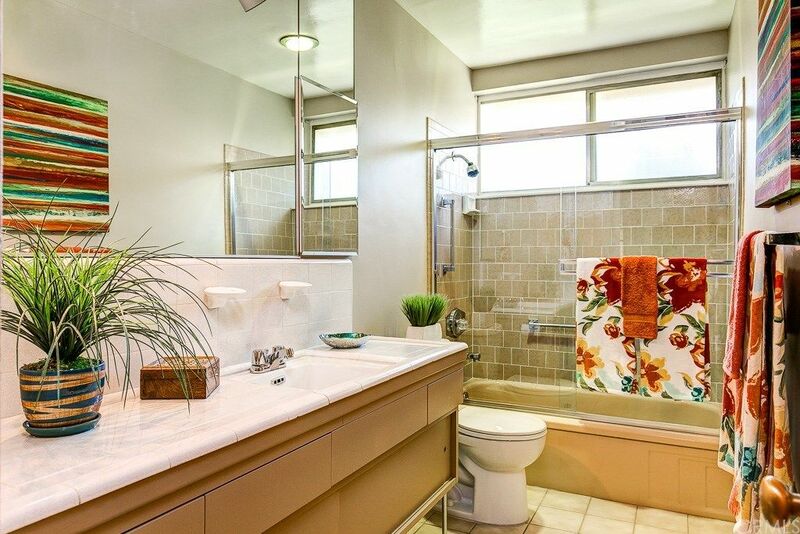 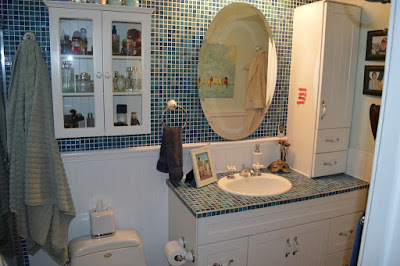 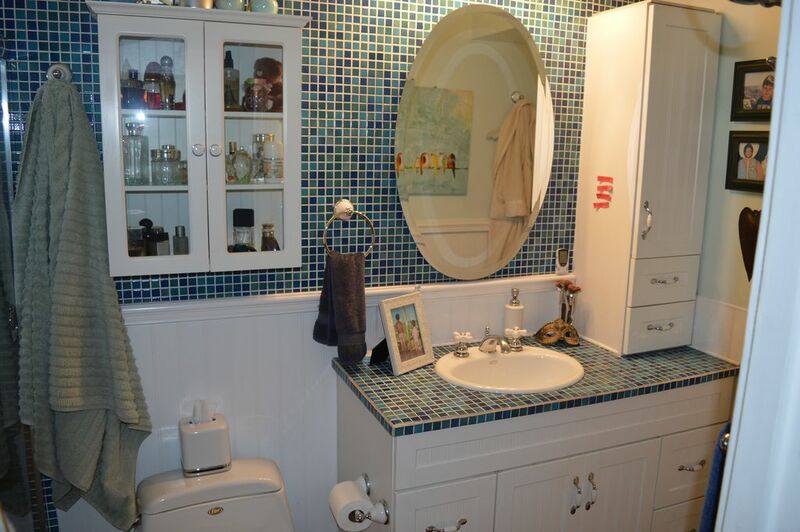 Both bathrooms are just as well-preserved and well-cared for as the kitchen, with original floating vanity and colored fixtures. 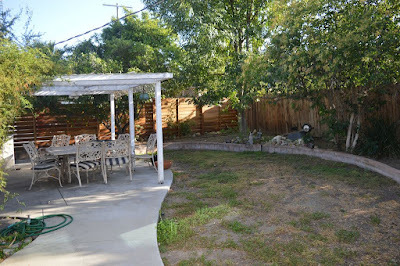 There aren’t any photos of the west-facing backyard provided, but aerial photographs tell us that its fairly efficient in size, with a modest patch of turf off of the screened porch. 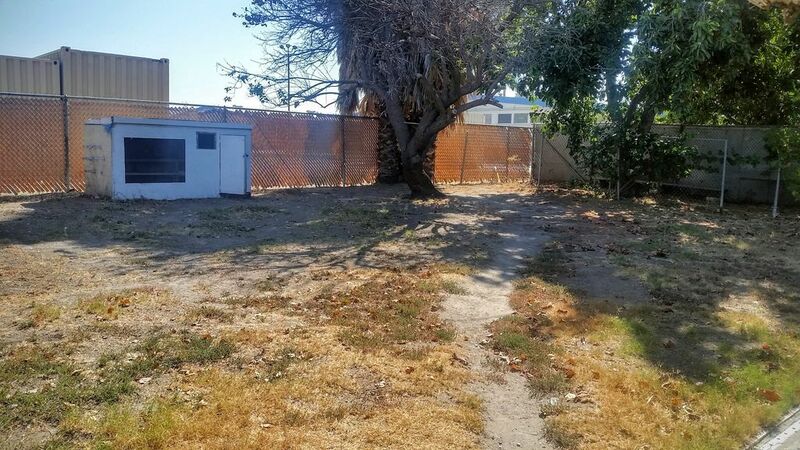 The perimeter of the yard is lined with a small planting strip and a singular small tree near the northwest corner of the yard. 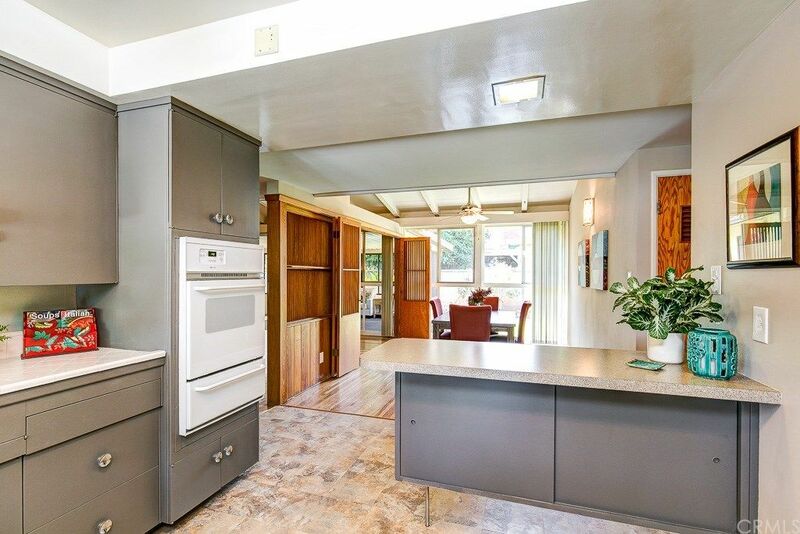 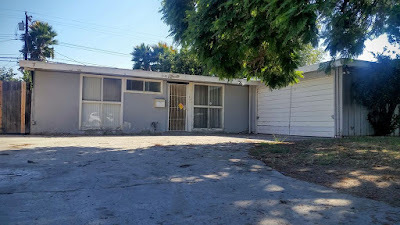 This midcentury Palmer & Krisel home shows great, and appears to have been well taken care of over the years. 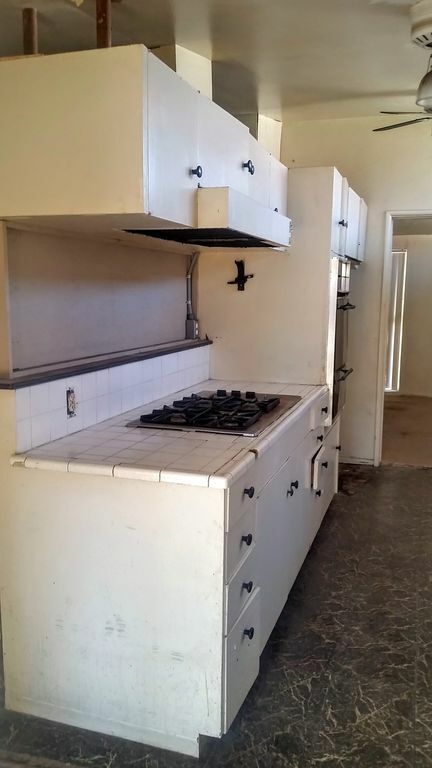 There’s lots of great, vintage features still intact on this one in impeccable condition. 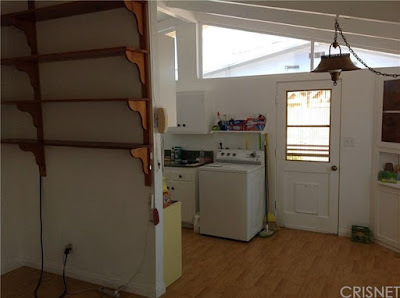 Redfin.com predicts this home will be a quick sell, be sure to check it out before its gone.